I'll admit to knowing absolutely zero about Vera Wang's ready-to-wear line, but if Look's juice is any indication, "more artsy" must be interpreted strictly in the relative sense. Look opens on fresh, sheer, fruity citrus with "watery greens"; it's sweet and apple-y, but too light and crisp to approach cloying (other notes: mandarin, lychee, lily, freesia, jasmine, oakmoss, vanilla, skin musk and patchouli). The heart is soft, nondescript blended florals, the base is very clean and rather pale, and while it's got a touch of musky-woody warmth and does darken a tad later into the dry down (it also gets just a teensy teensy bit powdery/velvety), the patchouli and oakmoss have been sanitized long past the point of recognition. Look is more sophisticated than Princess, but not by much, and of the six attributes quoted in the first paragraph above (bold, seductive, captivating, luxurious, prestigious, modern), the only one I'd vouch for is "modern", and even then, it isn't exactly "of the moment" — this sort of fruit + fresh stuff + flowers scent has been done often enough in the past 10 years. The attribute I'd select would probably be "safe". Mind you, it's pleasant enough and perfectly wearable, it just isn't at all interesting or unusual, and while it's arguably less bridal than the others in the line, it still strikes me as an essentially conservative fragrance. 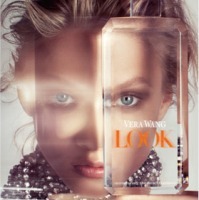 Vera Wang Look was developed by perfumer Annie Buzantian. It's available in 30, 50 and 100 ml Eau de Parfum, in 30 ml Parfum Elixir and in matching body products, and can be found at major department stores. * First quote via Moodie Report, 10/16/08, second and third quotes via Women's Wear Daily, 7/25/08. I tried this last week. While I don't dislike it, it's just not for me. Nondescript florals, clean and pale drydown, sanitized patchouli and oakmoss is the perfect description. It is the perfect scent for someone who wants a discreet office-appropriate scent. Yep, and “discreet office-appropriate scent” pretty much covers it. Personally I think it would be a lot better if they'd put it in a “fun” bottle like Princess — that bottle is pretty “discreet office-appropriate” too. I tried this yesterday and it is very boring. It smells like a dozen other scents out there. It is citrusy with aquatic notes and a touch of what is only recognizable patchouli because I read the notes. Yawn. I had the SA nearly jump in front of me and spritz me, which right there gets a point withdrawn. It found it pleasant, but nothing that suits me. It was still too girly and “tame” for my tastes. It is much better then Princess. I could wear it to the office – and never get noticed….it's a safe scent. I'm very surprised they didn't do something more trendy, in the “woods for women” mode or something, even if they didn't go too far in that direction. This has a very “5 years ago” kind of feel. Oh no, down with aggressive spritzers! Is this Available at Macy's yet? So far I've only seen it at Bloomies, Neiman Marcus & Nordstrom. Agree — they're really nicely done. Don't think they fit w/ the scent, which is way more casual, but whatever. So sad; the clothes are gooooooorgeus. Are they? I should go take a peek. “Smell and be smelled.” I like that! I think I'll adopt that as my motto. Is this the line that she has in Kohl's? I bought a deep plum tweed jacket this fall from her at Kohl's. Love the neckline which has a built in scarf that pulls through a slot in the collar. Very elegant fabric, nice tailoring, so-so made but for $59 (on sale) I'm not complaining. I also fingered some lovely blouses and tops, silky like fabric, swirly handpainted like designs in plum, gold, cream. Very nice and a great price. I once was in Macy's and I forget which scent it was, but the SA sprayed it on my wrist but got it all over a diesel down jacket I was wearing. Well I HATED said scent and could not for the life of me get it off my jacket even after washing. You know that jacket was given away. What a shame! I've had better luck w/ Tide than other detergents in removing scent. Febreze helps too. Lauriej, interesting, I found it soft but not really all that light — that is, it had reasonable sillage on me. But you're right that it isn't a heavy fragrance. I tried Look and it was mediocre. Its a scent to wear which can be mistaken as any flowery cologne from a drugstore. The flowers are a forgettable mix and leaves no statement, no gorgeous drydown, nothing. I have in fact been looking for a “in the woods for women´´ scent. I wish some new ones come out. The Vera Wang perfume in green made me think it would be the one, but unfortunately NOT. I think after the original Very Wang perfume came out, all else deteriorated. Have you tried Aliage by Estee Lauder, not everyone wears it, and it's affordable. Or the original Jean Louis Scherrer, very big green chypre with vetiver, ceder, musk, and moss. Yep, I used Alliage for years and Scherrer I still have some left. Something about this reminded me a little of “Clair de Musc” by SL. “Look” develops into something a bit tinny but is pleasant enough. I liked how it didn't evolve into the vinigerette florals of both “Vera Wang” and “Sheer Veil”. Interesting about CdM — I hardly remember that one & ought to try it again. Wow, that is really expensive for body cream (although admittedly I almost never check the prices for body cream, maybe it's the going rate).